Carbohydrates Cause Gout - We Know This...So Why Do We Eat Them? Maybe we’ve been wrong about what causes gout the whole time. In fact…I’m sure we have. So Why Do YOU Think Carbohydrates Cause Gout? Did the food change? Or did your body change? Did you start making too much uric acid? Or did your lose you ability to eliminate it? More than likely, your kidney function has diminished to the point that you are not eliminating the uric acid as well as you once did. Now when you eat those protein heavy foods that are rich in purines, that purine load metabolizes into excess uric acid and it is not getting eliminated as well as it used to. On top of that, all kinds of toxic, acidic materials have become sort “stuck” in your tissues and your body’s answer is to sequester the uric acid in some joint far away from your vital organs…like your big toe. At this point, we need to have a quick review of purines and uric acid and remember what they are, and how they become a problem. Purines are part of the structure of every cell, of every plant, animal and human being. The really interesting part of this is that there are two types of purines: Exogenous and Endogenous…the ones that we bring into our bodies from the plants and animals we eat, and the ones that make up the tissues of our own bodies. The greater part of our purine load comes from the breakdown and “recycling” of our own tissue material than it does from the foods we eat. But as the years go on, due to all the abuse and neglect we put our bodies through, (some people call this “getting old”) we end up creating a massive purine load and we tip the scales by adding purines from our dietary choices. Then, purines metabolize in uric acid like they’re supposed to. In turn, uric acid gets a bad rap for all the pain it causes when it turns into a gout attack. But the upside of uric acid is that it actually acts as an antioxidant, protecting the one-cell thick layer of the endothelial lining of our entire cardiovascular system from free radical damage. The thing to keep in mind is that it’s the kidneys’ job to sort of “monitor and regulate” how much uric acid stays in or goes out of your bloodstream. 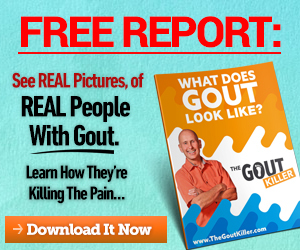 The reason you get gout now and you didn’t use to, is because your kidneys don’t work as well as they did in the years before you started getting gout all the time. But why? And, even more importantly, how do we recover their ability to do the job they once did? In our modern world, we have carb-based foods available to us at every turn. The beta cells in our pancreas produce insulin. Insulin is what let’s the glucose (blood sugar) into the cells to be “burned” to make ATP – i.e. the energy that powers our bodies. A) use it right away for quick energy in our muscles and brain…if we need it. C) If our bodies don’t need it and those glycogen stores are full, it is converted to triglycerides and stored in the adipose tissues…i.e. it turns into FAT! But throughout this whole progression, there is WAY too much sugar in our blood and if there is WAY too much sugar in our blood, there is typically WAY too much insulin in our blood trying to keep it under control! As Amy does such a great job of explaining, it’s the excess insulin that causes the diminished kidney function that results in poor elimination of uric acid. Our digestive system depends on healthy colonies (which is where the term “colon” comes from) of good bacteria that assist in breaking down the components of the food materials that we eat. In that process, new vitamins are synthesized and other nutrients and minerals are utilized. However, the gut environment of most people today is overrun – and the good, healthy, helpful bacteria is crowded out – by toxic and acidic bad bacteria, parasites, yeast, and fungus…all of which THRIVES on sugar…sugar in whatever form they can get. This dysbiotic condition creates a whole host of problems that can either directly or indirectly contribute to gout. From poor breakdown and utilization of proteins, to leaky gut syndrome, to mineral imbalance, to vitamin deficiencies. This promotes an unhealthy gastrointestinal terrain and simply creates the biochemical chaos that gout depends on. Interestingly enough, Dr. Steven Gundry has shed new light on old information that explains a lot about how we become biochemically imbalanced and end up with gout. In his book, The Plant Paradox, he explains how “lectins” add so much more to poor health conditions than we realize. We hear so much about “gluten” these days, and it is probably the most common and well-known lectins. To over simplify it, lectins are part of the biochemical defense mechanism that plants protect themselves with. Plants produce toxic chemicals at various stages of their growth and maturity to either discourage or encourage consumption by bacteria, insects, and animals (humans included). Some plants, when eaten, produce ill effects – especially when eaten before they ripen. Minute amounts of toxic chemicals can accumulate in the gut to produce long term ill effects – think green apples. However the foods highest in lectins are carbohydrate rich grain-based foods, and beans or legumes like lentils. Dr. Gundry also makes a point of how toxic fructose is and how it contributes directly to gout. A high percentage of fructose – the sugar in most fruit and widely used as high fructose corn syrup in processed foods – is shunted to the liver and converted to triglycerides and uric acid. This results in high blood pressure, gout, and damages the kidneys filtration system. A smaller percentage of fructose goes directly to the kidneys and is a direct assault on the kidney’s filtration capability. “Good” digestion is often thought of as: The food goes in one end, and comes out the other without much delay or disturbance in the process. That is only one piece of the puzzle and not the most important. Digestion is all about how well your digestive system extracts the usable nutrients from the foods that you consume and utilizes them to the greatest benefit. How much energy you have, your cognitive function, how robust your immune system is, and your physical strength are just a few examples of how your digestive system takes the raw materials of the foods you consume and best puts them to use to keep you “healthy”. 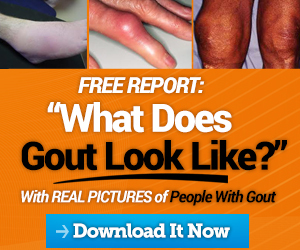 Bottom-line: Getting gout is not “healthy”. When you are “healthy”, you don’t get gout. Leaky gut syndrome, as mentioned above, is an out of control problem in the world today and most people are completely unaware of it. Due to lectins like gluten and other proteins, as well as other contributing factors, these protein materials make their way into our blood stream in the wrong shapes and sizes. When they do that, they are perceived by the immune system as being “foreign invaders”. Some of these proteins “look” a lot like the proteins that make up various tissues that make up our glands, organs, etc. When the immune system “sees” them, it tries to destroy them…and anything that looks like them…like some of our organs and tissues. A good example is Hashimoto’s Thryoiditis…which I have. Dr. Isabella Wentz (who I have met) talks about how this effects men and can be a cause of compromised kidney function that leads to gout. 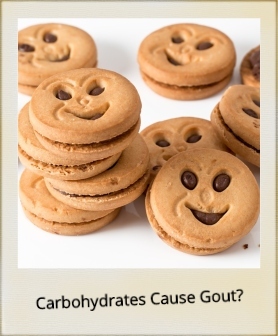 ☆ Remember: There are a number of ways that carbohydrates cause gout…what can you do about it? Get my video program and lets get busy! Two decades ago, Bert Middleton found himself diagnosed with gout. Like 8.3 million other people in the United States (approximately 4% of the population), he struggled helplessly with the physical, emotional, social, and financial impact that gout left unchecked can have on your life. And the terrible pain of regular gout attacks left him unable to enjoy even the simplest daily pleasures. His marriage was suffering. His finances were spiraling due to the impact gout had on his ability to work. And maintaining a social life was often nearly impossible. Tophi surgeries left him in terrible pain. And he found himself depressed … and angry … that gout was stealing years of his life. 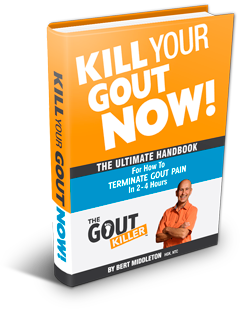 Until one day, after hundreds of hours of research and self-experimentation, Bert finally had a breakthrough and created a blueprint for a way of living that would prove to be “the answer” to living gout-free for nearly a decade now. Showing others his 911 Emergency Response Gout Recovery Plan for getting PAINFUL gout attacks under control in as little as 4 hours. 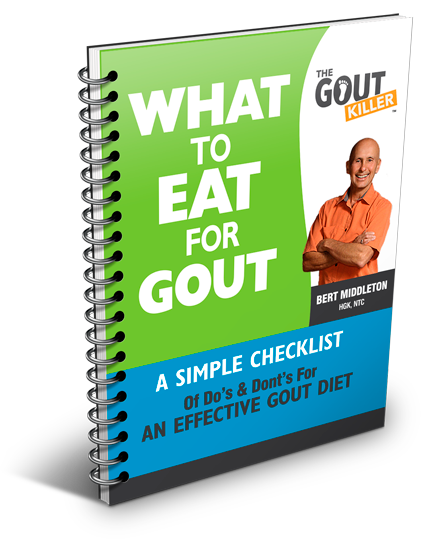 And then, how to make daily choices that keep gout under control for GOOD! So you can finally start LIVING again! I'm so grateful to have found this site. My husband has his first gout attack 3 weeks ago. The pain is under control, but now were left with what to eat and what not to eat. So much to leave and so far, all of our questions seem to be addressed right here. Thank you so much. I'm glad you and your husband are finding all the information useful Cliff - keep up the good gout killin' work and let me know how I can help! 2019 - The Year of The Gout Killer!